Palak paneer dhaba style recipe or restaurant style recipe gives you delicious palak paneer curry which can be made at home easily without compromising for the restaurant taste. This is not an authentic palak paneer recipe, but this is a very easy method of palak paneer preparation that helps you to make the palak paneer so easily at home. And this is a palak paneer recipe with tomatoes too, but you may skip the tomato if you would like to make the palak paneer without tomatoes. I also have this more easy, simple and delicious palak paneer curry without cream in case you do not have heavy cream or tomatoes or onions at home or if you want to reduce the amount of fat. Palak paneer is often prepared by blanching spinach leaves (boiling the leaves for about a minute and then immediately transferring to ice cold water for an ice bath before grinding) however in this easy method of homemade palak paneer preparation, the palak paneer is prepared without boiling or blanching the spinach leaves first, making it very easy method to make the palak paneer, but without compromising on the restaurant style taste. 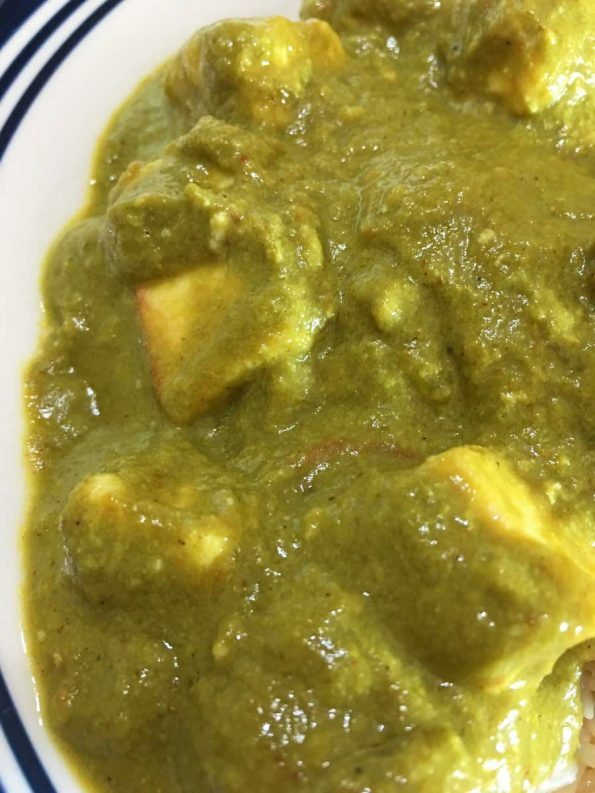 Palak paneer gravy or paneer spinach curry is one of the most popular paneer dishes or even one of the most popular Indian dishes that you can find. This easy palak paneer made using fresh spinach leaves, paneer (Indian cottage cheese), onions, spices, cashews and cream goes great with chapathi, nan, pulao, rice etc. 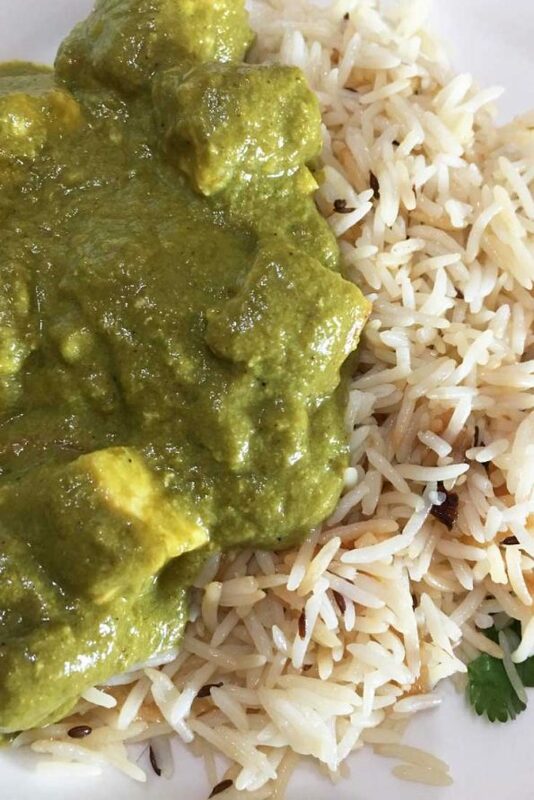 I served this palak paneer with jeera rice as you can see from the pictures. I also serve this with Indian bread like chapathi, nan, poori etc or with plain white rice or brown rice. Palak paneer is a very popular, simple, delicious and classic Indian style dish that can be prepared at your home for an everyday meal or it can be prepared for an easy vegetarian Indian dinner, party or potluck. I have always found that palak paneer is one of the most easy paneer dishes that you can prepare. Everyone and every family has their own way of preparing this classic favorite, and I have made this dish in different ways at different times. 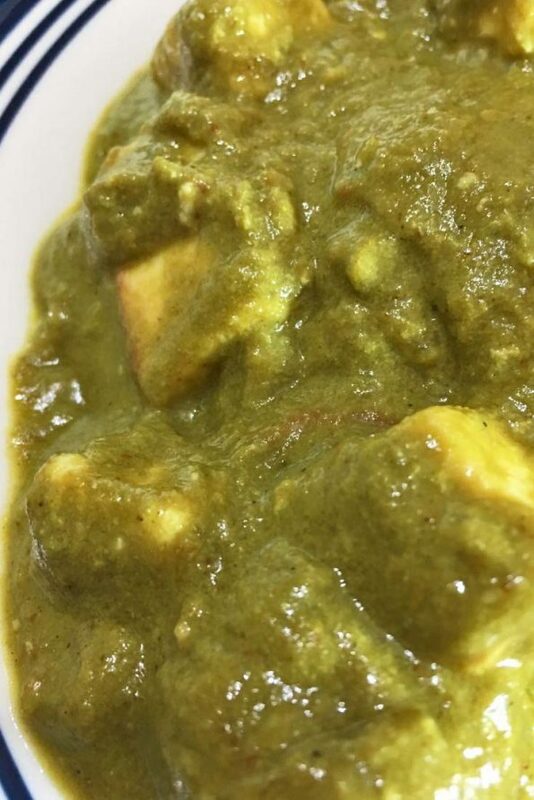 Out of all these trials, I particularly like this palak paneer curry recipe that I am sharing here, as this way of preparation was easy and it has delivered the restaurant taste that you always look for in a homemade version of the same! We use heavy cream, cashews, ginger garlic paste, onions and spices and of course fresh palak leaves (spinach leaves) and best quality paneer to make this palak paneer following this recipe. Always make sure to use fresh, good quality ingredients for the best results. The addition of fresh heavy cream and cashews make this dish very rich, delicious and flavorful (along with the spices and onions) so make sure to use these while you make this dish for the best results. So here is how you can make this easy and delicious palak paneer following this easy palak paneer recipe. delicious, creamy and easy way to make palak paneer curry at home that gives you the restaurant taste, but this is more easy to make at home as we do not blanch the spinach leaves (you can do so if you wish). This palak paneer curry goes great with chapathi, poori, rice, pulao etc. Peel the onion and slice the onion in thin long slices. Chop the tomato in small sized pieces, keep this separately from the chopped onions. Heat 1 tablespoon of oil in a pan, lightly fry the cumin seeds. Add the cinnamon stick, lightly fry and add the chopped onion, saute the onions until the onions are lightly browned, which will take around 15 to 20 minutes of time. You do not need to caramelize the onions, but sauteing the onions really well until its browned is necessary. Meanwhile soak the cashews in enough water for at least 15 to 30 minutes which will soften the cashews. Wash the spinach and keep aside. Take about half of the sauteed onions (do not use all) and transfer it to a blender. Also add the washed spinach, soaked cashews (may discard the water used for soaking) and also the 3 cups of water and blend the contents until very smooth. You may also blend the cashews separately in very little water if that is more easy for you. Meanwhile add the ginger garlic paste also to the pan with the remaining sauteed onions and saute for another 1 to 2 minutes until the raw smell goes away. Also add the chopped tomatoes to the pan and saute the mixture until the tomatoes are lightly fried which will take around 3 to 4 minutes in low heat. Add the butter to the pan, and as the butter is melted, mix well and transfer the blended spinach cashew mixture to the pan and mix in with the tomato onion mixture in the pan. Now the base for the gravy is prepared. Heat the contents and bring the mixture to a boil and cook in medium heat for 2 to 3 minutes. Close the pan with lid, reduce the heat to low and cook for another 5 to 6 minutes or until the spinach gravy is cooked enough. Add enough salt and add the following spice powders - turmeric powder, red chili powder, coriander powder and garam masala powder, mix everything well. Cook this mixture for another 1 to 2 minutes in low heat so the gravy is well blended with the spices. Now the gravy is ready, let us prepare the paneer for the curry. Heat enough oil (about 4 tablespoons or as need) in an iron skillet or pan or kadai and add the sliced paneer cubes and enough salt. If possible, layer the paneer cubes in a single layer and wait until one side of the paneer cubes get lightly fried. Once one side is enough fried so that it won't stick anymore to the skillet, carefully and gently flip the paneer cubes using a good quality spatula and fry the other side too. Frying the paneer will take around 4 to 5 minutes of time in low heat. Once the paneer is lightly fried, transfer the fried paneer to a plate lined with paper towel so it will absorb any excess oil. Now the paneer is ready to be used in the curry. Transfer the fried paneer to the prepared gravy, gently mix in. Cover and cook the contents in low heat for another 2 minutes. Add the kasoori methi and mix well. Finally add the heavy cream and mix with the curry. Now switch off the stove and keep the pan away from heat. 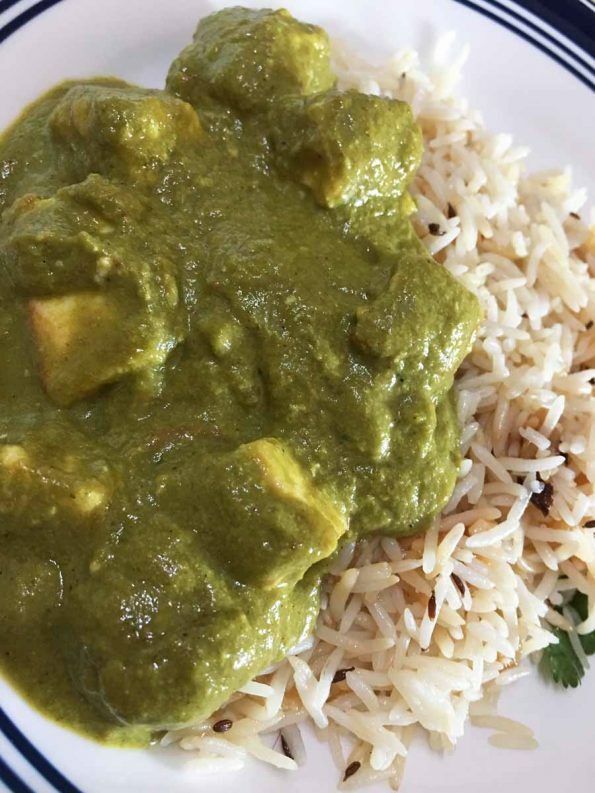 The delicious palak paneer or spinach paneer curry is ready to be served! Enjoy with rice, pulao, roti, chapati or poori as you wish! We did not blanch the spinach leaves to make this palak paneer, but you may blanch the spinach leaves before grinding the leaves, if you wish to do so. Also you may add about 1/4 cup of fresh cilantro leaves (coriander leaves ) which can be grind along with the palak leaves if you like to add them. 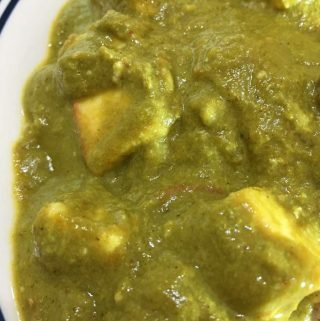 Hope you found this post on easy dhaba style or easy restaurant style palak paneer curry recipe helpful in making easy and delicious restaurant style palak paneer curry at home.